Insomnia – A solid film that was perhaps the last really good thing Pacino has done and reminded us that Robin Williams does creepy as well as over the top hamming. Memento – A masterfully created film about a man with an inability to create new memories, all shown in reverse. The Prestige – An intricately crafted Tale of two magicians that kept you guessing right up to the twist at the end. Batman Begins – So he didn’t create the source material, but who else would have the balls to take an iconic character like Batman, whose films have steadily decreased in quality since Burton made Batman in 1989, flip it on its head and turn it into one of the better crafted blockbusters in decades? The Dark Knight – I’ll tell you who else: only the guy that made the follow up to the unexpected breakthrough Batman Begins even better. Not a bad decade, five films, all five very worthwhile checking out, three of them are OGR certified great. The difference with Nolan is his willingness to tackle the new and unknown, no concessions are given. Memento was told in reverse, yeah Batman was already entrenched in the public eye but Nolan took the film into a whole new direction, providing it with great credibility in the process, and The Prestige refused to dumb down the plot for those who refuse to think for themselves, you either got it or you didn’t. And now with Inception Nolan refuses to leak any details of the film to the salivating press, choosing instead to let the film speak for itself. Whether he meant it or not this has meant anticipation was at fever pitch up to the release, with fanboys and critics lining up to crush anyone who claimed Inception was anything less than brilliant, even if they themselves haven’t seen it. Well now it’s out there. And I have seen it. And it is very good, not great, but very good. At 148 minutes in duration you would think I would explain more of the plot than I am about to, but in honour of Mr Nolan’s unspoken wishes I’ll just provide the briefest of outlines. Big business has always used any technique to gain an edge on the competition, Dom Cobb (Leo DiCaprio) is essentially a dream-thief, breaking into people’s subconscious to extract their thoughts and ideas. He and right-hand man Arthur are hired by a Japanese businessman Saito (Ken Watanabe) to take things a step further, instead of extracting an idea he is asked to plant an idea in the mind of Robert Fischer Jr, the son of powerful businessman Fischer Sr, who lies on his deathbed. This process is unsurprisingly called Inception. So Cobb puts together a team of dream experts including the undercover man Eames (Tom Hardy), the sedation expert Yusuf (Dileep Rao) and the “architect” Ariadne (Ellen Page). Ariadne is hired upon a recommendation by Dom’s father (Michael Caine) himself a pioneer in exploring the subconscious. Dom tells Ariadne everything he knows and is surprised when she picks up techniques and skills very swiftly, Ariadne learns that Dom was once the best in the biz, but now is unwilling to create dreamworlds himself for reasons involving his ex-wife Mal. The elaborate scheme is planned to take place over three levels of imagination, the deeper into the mind that they go the slower time moves, leading to a crescendo where everyone on the three levels must complete their tasks before pre-designed triggers wake them all up so that they might exit the process safely, only they are all moving at different speeds and in another wrinkle dealing with varying degrees of gravity. A by-product of this is the fact that the visual deadline is established about half way through the film: the spoiler-free version has a van driving off a bridge into the water below, only the van takes at least an hour to hit the water! Each time we revisit the damn van it seems closer than ever, but we can see it still has a ways to go. Once inside the mind Cobb informs the team of the unique problems pertaining to this particular job, in normal circumstances if someone is killed in a dream that person wakes up unharmed, only this time the depth of the slumber means that the dream-dead will be unable to simply wake up, and their mind will float in limbo for decades unless it is saved by someone else. Also any pain or injury to the dream crashers (That would be a cooler name for the film by the way, The Dream Crashers!) results in mental distress and anguish, and ultimately damage to the fragile brain. Good thing he told them that after they were in right! This becomes especially important if they are noticed by other characters roaming through the subconscious of Fischer, as anything unexpected or too different is set upon viciously by armed soldiers determined to wipe out the insurgents. So for at least 90 minutes in the film Cobb and his team must perform their hugely intricate tasks across many level in Fischer’s mind, while ensuring he remains unaware of the nature of their “visit” and open to their presence. If Inception took place in my feeble mind Dom and co would be having to ward of millions of naked Salma’s hellbent on getting to me to lavish me with attention. Hey it’s my dream! …Or as Mitch Hedberg said in one of his stand-up routines they might end up “building a treehouse with my ex-landlord”. I thought dreams were generally far more “out there” than just a bunch of people in suits walking around clean streets and modern buildings, regardless that’s generally what we find here. 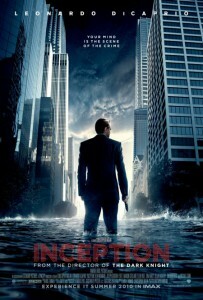 Inception has some impressive set pieces and remarkable imagery, one thing it lacks is humour, heart and energy. Bar Tom Hardy’s Eames there is nary a joke or smile to be seen through the 2 ½ hours, like the task before them the film is technically excellent and the performances similarly robotic, that doesn’t mean they are bad, just honed to perfection but so very dry and lacking improvisation, passion or spark. We shouldn’t be surprised I guess, after all none of the 5 previous films would be called ribtickling or oddball. We should just be grateful that there is even a guy like Christopher Nolan out there willing to try to come up with original material rather than just exploiting the same old tired genre pieces and cannibalising the work of others. 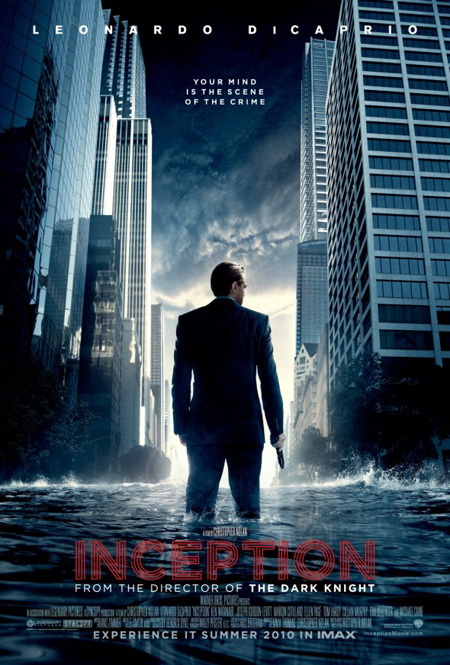 Inception isn’t the great work that many convinced themselves it would be for months before release, but it is a very good one. In this case though perhaps the populace allowed themselves to have the perception of Greatness lodged in their brains without any proof. This is not called Inception though, this is simply the power of Anticipation. Final Rating – 8 / 10. Breathtaking visuals and a labyrinthine plot introducing entirely new concepts to cinema are an indication of great creativity, but in this case not quite true Greatness.